Client Testimonials - Renovations Roofing & Remodeling, Inc.
We are honored by what our clients have to say about our services. Below are some of the testimonials that we’ve received. Nora and I just wanted to send you a letter to express our sincere gratitude and appreciation for how professionally and efficiently you handled our home repairs and the claim with our Homeowners Company, USAA. When we called Renovations, you immediately called us back, came to our home the next day and advised us on what options we would have regarding the damage to our home. The estimate that you provided to us USAA was extremely comprehensive and made the claim process go without problems at all. During the constructions process, Renovations, yourself and your personnel were very accommodating to us due to the inconvenience of losing the use of the majority of our home for 6 weeks and they were all a pleasure to deal with. when we had questions or concerns, they were immediately addressed. The quality of the work that was done was, actually better than the original quality of our 5 year old home when it was built. Overall, we would give you and Renovations an A+++ from start to finish and would recommend your company and day because of our experience. It is difficult to have a catastrophic loss in the home and the relief that you provided through excellent communication and quality work is a direct reflection of the success of your company. Thank you very much for everything and we wish you all the best in the growth of Renovations Roofing and Remodeling, Inc. Thank you very much for getting the job done quick. We really appreciate you taking care of us. Done well. Your attentiveness to the repair in my home was wonderful. Why can’t all contractors be so efficient and trustworthy? Thank you so much, Jack, for all you’ve done. It looks great! I look forward to receiving your business cards so I can pass them around my neighborhood. Thank you so much. It has been a pleasure doing business with “Renovations”. Mickey has been so helpful, and always prompt in returning calls/e-mails and answering all of our questions. All of the guys who spent 2.5 days doing our shingles, were hard workers, very polite, and they did a great job. It is so nice dealing with a business that does what they say they do. Thank you very much for the great job you did replacing our roof. Your crew were wonderful. You have definitely restored our trust in contractors. Respectfully, Don & Barbera K.
Milford Place Board & Emg. On behalf of Milford Place Condominiums – Please accept our sincerest thanks for our wonderful new roofs! You quite simply went tout of your way to give us first class in everything. You simply are the best! Just a note to express our heartfelt gratitude for coming out to our “Ginger House” and speaking with us! Thanks you and your great work crew for the outstanding job and they were very professional and very hard workers. Please extend our thanks to them! God bless you, and may God continue to bless your business, your work crews, and all their families with every grace and blessing. Thanks for the great service and a great job! 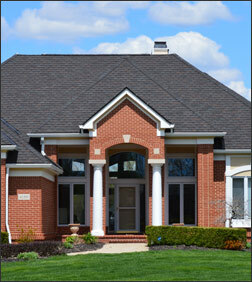 -Pam D.
If you would like to learn more about what Renovations Roofing & Remodeling, Inc. can do, please contact us.